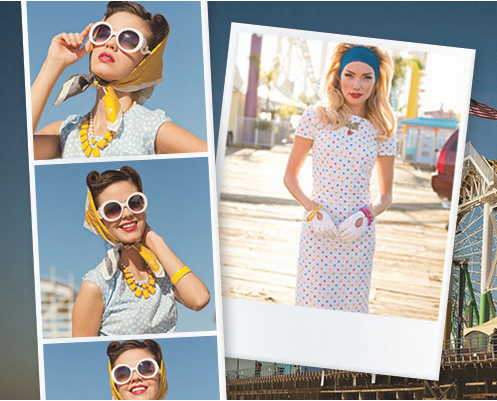 Shabby Apple dress shop is giving away a $50 gift card to a Life in Technicolor reader! I've been a huge fan of their classy-vintage-with-a-twist dresses for several years now, and in fact, I just wore this lace number as a bridesmaid's dress for a wedding I was in! So needless to say I am pretty excited about this giveaway haha. 1) Be a follower of "Life in Technicolor"
3) Leave a comment below citing which Shabby Apple dress or other item is your favorite! And you can get 10% off any purchase you make if you enter lifeintechnicolor10off at the checkout! I'm totally going to be annoying and copy you on your favorite dress. That polka dot peplum dress is gorgeous! I am in love with the Falling Star lace dress. So classy! I'm following your fabulous blog and like Shabby Apple on Facebook as Rebekah Faith Garmon. I love the CHAMPS ELYSEES! I think it is so darling! Whoa. I didn't even know this place existed! I LOVE IT. I need to get me some dresses, skirts and a swimsuit here. I am especially in love with Dipper Skirt (wish it was summer soooo bad right now) and the Francine. Oh my goodness. In love. Grace, this is SO COOL! You have a giveaway?! GEEZ. Love this! Um I'm loving the Santa Monica, oh oh and Blue Eyes. Ah! And Jacob's Pillow. Ok. So obviously I'm having a hard time deciding but it is only because they are so cute. Fingers crossed! Okay, I'm obsessed with the peplum polkadot dress!! :) SO cute! I also like the El Capitan!!! El Capitan and Estate are my favorites. :) Shabby Apple is awesome, congratulations to whoever wins! I'm a sucker for polka dots, so I would have to agree with you on the peplum beauty one! I also liked their Facebook page! I want the rootbeer float dress! and, i need a new swim suit and love the 'sweet spot' one! crossing my fingers. Hey Grace! I like the Facebook page, happily follow your blog and I would love to get some new clothes while at college :) Pretty sure I would live in that yellow dress if it was summertime right now. Thanks for the opportunity! I'm thinking Whistlestop? Or maybe Ms. Porter. I too LOVE the polka dot peplum beauty!! I have been eyeing this dress for several months, as I have been shopping for my LDS mission!! It's too perfect! I love their classy and modest style!! Hi! I liked the FB page! I have been a huge follower of both you and Shabby Apple so this is perfect! My favorite dress at the moment is the Night Train. Thanks so much for this cool opportunity! I love 'Tea Time'. Such a lovely shade of purple! I loved the Red Queen dress! SO cute. I love love love the high tea skirt! I'm trying to find mission appropriate skirts and this one looks perfect! Follower and Liked the on FB. I would get the Jacob's Pillow polka dot dress or the lovebug blouse or the santa monica dress or the california sunset skirt! AHHHH I love them all! I want want want!! haha. Following you via GFC, like Shabby Apple on FB, and I am smitten with the new Venice Beach dress (https://www.shabbyapple.com/p-2000-venice-beach.aspx) because of that gorgeous color! I "liked" Shabby Apple on Facebook and that yellow dress is too perfect for summer. I am obsessed! I also really love the Trajan Cuff and the Metropolitan Blouse!! I follow you via bloglovin, like Shabby Apple on fb and love the Admiral dress. Love your blog! I just liked Shabby Apple on Facebook. They have the cutest clothes but I think Overboard dress with the checkers and red belt is my favorite! Hi Grace!! I love your adorable blog, and I have to admit that I've definitely read your study abroad posts about 1000 times each! I just liked Shabby Apple on Facebook... also, choosing only one dress was soo hard, but I'm going to have to go with "Alice"... I'm just in love with lace dresses I guess! LOVE the park and follies skirt! I love the Lilly bouse and Lovebug blouse! I adore the Jacobs pillow and Knave of Hearts dress! I love Shabby Apple! Grace! I LOVE the "overboard" dress! And I love your blog! Thanks for sharing - I've never heard of them before. I am in love with the Metropolitan Blouse and the Palatine Hill dress, fingers crossed! I have started following your adorable blog and like Shabby Apple on facebook! One of my favorites is the Bellissima dress! i've been searching for the perfect graduation dress, and i love jacob's pillow, but i also love whistlestop. either way i'd look awesome at graduation this april! I love, love, love the headliner dress! So adorable! I follow you! And I've already liked Shabby Apple on Facebook! My favorite is Santa Monica and Blue Eyes! And any of the Ferris Wheel collection, so cute! I love Shabby Apple! I already love and Like Shabby Apple, and your blog. The Beauty Mark dress is the perfect piece for every closet. I would love to buy the "Frabjous day" dress from their Mad Hatter line! So beautiful. Thanks for the awesome giveaway! Wait! I just saw that it's no longer on their website. My new favorite dress (really, how could I pick just one??) is: Santa Monica!